Pressure microinjection can be used to introduce fluorescent dyes and labeled macromolecules into single cells. The method allows measuring transport activity of macromolecules such as proteins and RNA molecules within and between cells. 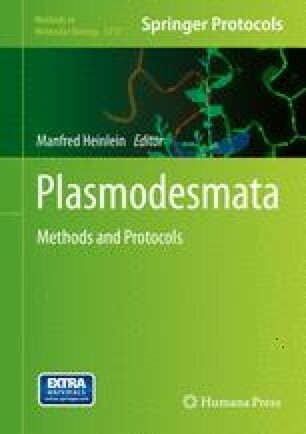 Routinely, plant mesophyll cells are injected with fluorescent dextran molecules of specific sizes to measure an increase of the size exclusion limit of plasmodesmata in the presence of a co-injected or expressed protein. The mobility of a macromolecule can also be addressed directly by injecting a recombinant protein that itself is labeled with fluorescent dye and following its transport to neighboring cells. This chapter describes a pressure microinjection protocol successfully applied to Nicotiana leaves. This protocol requires basic skills and experience in handling a microscope equipped with an imaging system, a micromanipulator, and a microinjection system attached to an upright microscope. Using this equipment, a trained person can inject approximately 10–20 mesophyll cells per hour.